Today, Harvard's servers were brought to their knees dealing with international demand to watch a press conference about ... gravitational waves. It's no surprise: as physicist Marc Kamionkowski reflected, "It's not everyday you wake up and learn something completely new about the early universe." Kamionkowski and his team were there to announce that B-modes of gravitational waves have been detected in the cosmic microwave background radiation. Put simply, this is the best evidence yet that our universe was formed when very rapid expansion known as the Big Bang started a process that physicists call "inflation." As a result of this rapid inflation of physical space, everything in the universe was born. Gravitational waves have been observed before, but the B-mode polarization is something new. This is a kind of gravitational wave that cosmological theorists have predicted would peak during those first 10-34 seconds of the primordial universe when we exploded from nothing into everything. So this announcement today confirms our first real observations of early inflation. Now that we can see B-mode gravitational waves, those observations put limits on just what happened when our universe was young, and how it got to be way it is today. Weekend gossip in the cosmology community was at a fever pitch, and turned out to be right — scientists working with Antarctic telescope BICEP-2 have very good evidence for gravitational waves. How good? This kind of supercooling can explain why the universe today is so incredibly flat — and therefore resolve the fine-tuning paradox pointed out by Bob Dicks in his Einstein Day lectures. This isn't the first time gravitational waves have been detected. The 10-meter South Pole Telescope detected gravitational wave B-modes last summer, then Polarbear confirmed those results. What makes the BICEP-2 discovery different is that it's detecting primordial gravitational waves right at that early moment in the universe when waves from inflation are expected to peak. The actual signal is the faint twisting pattern in the polarization data. Mathematically, it's the curl. Colloquially, today's stories are going to be full of swirls. Why does it matter? In a world with no data, all theories are equal. We now have data, so the number of inflation models that still make sense is a much smaller set. Even with this announcement, research isn't done — more projects going forward will be expanding and confirming these results. For more on all the details, Nature is running an entire special on gravitational waves and inflation. We also had some awesome discussion in the comments section yesterday about potential implications, with cosmologists from other projects jumping in to clarify. As for what came before the Big Bang? "No one from our collaboration is allowed to answer that," says physicist John Kovac. All the source papers and maps are already online on the BICEP site, and should go live on arXiv tomorrow. All graphics courtesy of the BICEP-2. 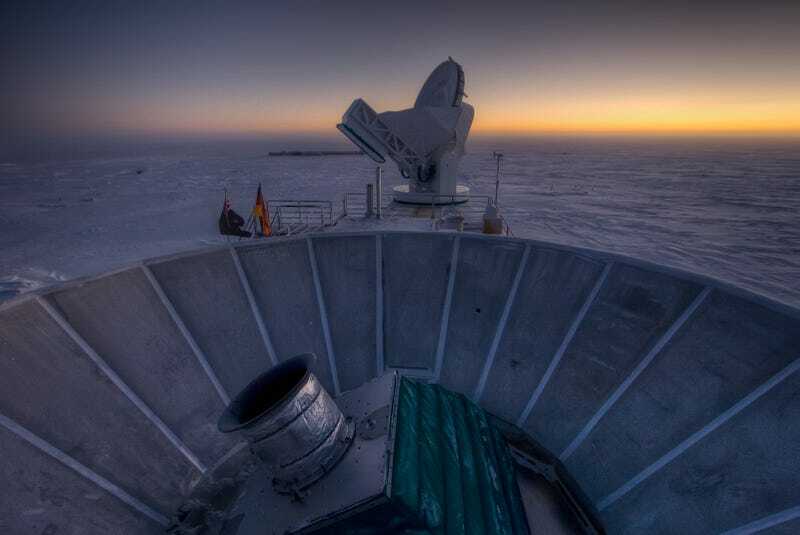 Photograph of BICEP2 and the South Pole Telescope at sunset by Steffen Richter of Harvard University.